What combines cryptography, art, mapping, treasure hunting, collecting, networking, and the great outdoors? A relatively new "sport" called letterboxing. 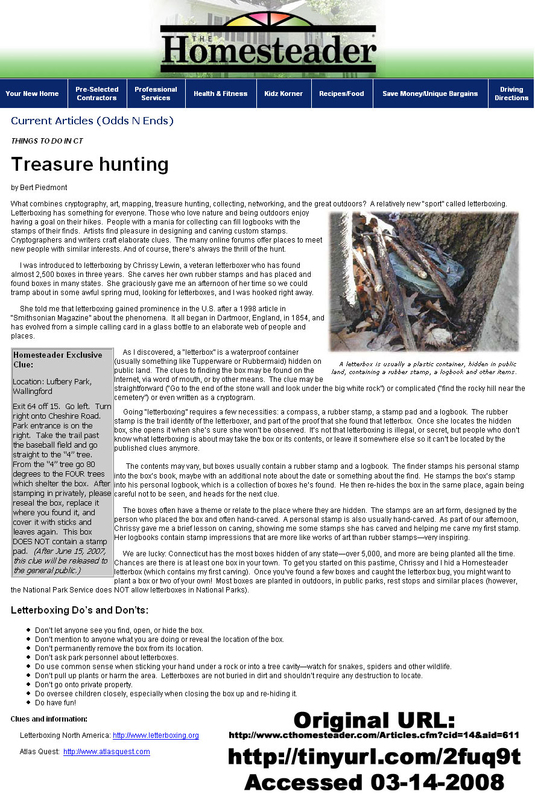 Letterboxing has something for everyone. Those who love nature and being outdoors enjoy having a goal on their hikes. People with a mania for collecting can fill logbooks with the stamps of their finds. Artists find pleasure in designing and carving custom stamps. Cryptographers and writers craft elaborate clues. The many online forums offer places to meet new people with similar interests. And of course, there's always the thrill of the hunt. I was introduced to letterboxing by Chrissy Lewin, a veteran letterboxer who has found almost 2,500 boxes in three years. She carves her own rubber stamps and has placed and found boxes in many states. She graciously gave me an afternoon of her time so we could tramp about in some awful spring mud, looking for letterboxes, and l was hooked right away. She told me that letterboxing gained prominence in the U.S. after a 1998 article in "Smithsonian Magazine" about the phenomena. It all began in Dartmoor, England, in 1854, and has evolved from a simple calling card in a glass bottle to an elaborate web of people and places. Don't let anyone see you find, open, or hide the box. Don't mention to anyone what you are doing or reveal the location of the box. Don't permanently remove the box from its location. Don't ask park personnel about letterboxes. Do use common sense when sticking your hand under a rock or into a tree cavity�watch for snakes, spiders and other wildlife. Don't pull up plants or harm the area. Letterboxes are not buried in dirt and shouldn't require any destruction to locate. Don't go onto private properly. Do oversee children closely, especially when closing the box up and re-hiding it. As I discovered, a "letterbox" is a waterproof container (usually something like Tupperware or Rubbermaid) hidden on public land. The clues to finding the box may be found on the Internet, via word of mouth, or by other means. The clue may be straightforward ("Go to the end of the stone wall and look under the big white rock") or complicated ("find the rocky hill near the cemetery") or even written as a cryptogram. Going "letterboxing" requires a few necessities: a compass, a rubber stamp, a stamp pad and a logbook. The rubber stamp is the trail identity of the letterboxer, and part of the proof that she found that letterbox. Once she locates the hidden box, she opens it when she's sure she won't be observed. lt's not that letterboxing is illegal, or secret, but people who don't know what letterboxing is about may take the box or its contents, or leave it somewhere else so it can't be located by the published clues anymore. The contents may vary, but boxes usually contain a rubber stamp and a logbook. The finder stamps his personal stamp into the box's book, maybe with an additional note about the date or something about the find. He stamps the box's stamp into his personal logbook, which is a collection of boxes he's found. He then re-hides the box in the same place, again being careful not to be seen, and heads for the next clue. The boxes often have a theme or relate to the place where they are hidden. The stamps are an art form, designed by the person who placed the box and often hand-carved. A personal stamp is also usually hand-carved. As part of our afternoon, Chrissy gave me a brief lesson on carving, showing me some stamps she has carved and helping me carve my first stamp. Her logbooks contain stamp impressions that are more like works of art than rubber stamps�very inspiring. We are lucky: Connecticut has the most boxes hidden of any state�over 5,000, and more are being planted all the time. Chances are there is at least one box in your town. To get you started on this pastime, Chrissy and I hid a Homesteader letterbox (which contains my first carving). Once you've found a few boxes and caught the letterbox bug, you might want to plant a box or two of your own! Most boxes are planted in outdoors, in public parks, rest stops and similar places (however, the National Park Service does NOT allow letterboxes in National Parks). (c) 2007. Information may be out of date. As far as I know, the Homesteader box is still in the park; I never retrieved it.